Post: Gaurav Akrani. Date: 9/01/2010. Comments (7). Label: Banking, India. As a central bank, the Reserve Bank has significant powers and duties to perform. For smooth and speedy progress of the Indian Financial System, it has to perform some important tasks. Among others it includes maintaining monetary and financial stability, to develop and maintain stable payment system, to promote and develop financial infrastructure and to regulate or control the financial institutions. For simplification, the functions of the Reserve Bank are classified into the traditional functions, the development functions and supervisory functions. Traditional functions are those functions which every central bank of each nation performs all over the world. Basically these functions are in line with the objectives with which the bank is set up. It includes fundamental functions of the Central Bank. They comprise the following tasks. Issue of Currency Notes : The RBI has the sole right or authority or monopoly of issuing currency notes except one rupee note and coins of smaller denomination. These currency notes are legal tender issued by the RBI. Currently it is in denominations of Rs. 2, 5, 10, 20, 50, 100, 500, and 1,000. The RBI has powers not only to issue and withdraw but even to exchange these currency notes for other denominations. It issues these notes against the security of gold bullion, foreign securities, rupee coins, exchange bills and promissory notes and government of India bonds. Banker to other Banks : The RBI being an apex monitory institution has obligatory powers to guide, help and direct other commercial banks in the country. The RBI can control the volumes of banks reserves and allow other banks to create credit in that proportion. Every commercial bank has to maintain a part of their reserves with its parent's viz. the RBI. Similarly in need or in urgency these banks approach the RBI for fund. Thus it is called as the lender of the last resort. Banker to the Government : The RBI being the apex monitory body has to work as an agent of the central and state governments. It performs various banking function such as to accept deposits, taxes and make payments on behalf of the government. It works as a representative of the government even at the international level. It maintains government accounts, provides financial advice to the government. It manages government public debts and maintains foreign exchange reserves on behalf of the government. It provides overdraft facility to the government when it faces financial crunch. Exchange Rate Management : It is an essential function of the RBI. In order to maintain stability in the external value of rupee, it has to prepare domestic policies in that direction. Also it needs to prepare and implement the foreign exchange rate policy which will help in attaining the exchange rate stability. In order to maintain the exchange rate stability it has to bring demand and supply of the foreign currency (U.S Dollar) close to each other. Credit Control Function : Commercial bank in the country creates credit according to the demand in the economy. But if this credit creation is unchecked or unregulated then it leads the economy into inflationary cycles. On the other credit creation is below the required limit then it harms the growth of the economy. As a central bank of the nation the RBI has to look for growth with price stability. Thus it regulates the credit creation capacity of commercial banks by using various credit control tools. Supervisory Function : The RBI has been endowed with vast powers for supervising the banking system in the country. It has powers to issue license for setting up new banks, to open new braches, to decide minimum reserves, to inspect functioning of commercial banks in India and abroad, and to guide and direct the commercial banks in India. It can have periodical inspections an audit of the commercial banks in India. Along with the routine traditional functions, central banks especially in the developing country like India have to perform numerous functions. These functions are country specific functions and can change according to the requirements of that country. The RBI has been performing as a promoter of the financial system since its inception. Some of the major development functions of the RBI are maintained below. Development of the Financial System : The financial system comprises the financial institutions, financial markets and financial instruments. The sound and efficient financial system is a precondition of the rapid economic development of the nation. The RBI has encouraged establishment of main banking and non-banking institutions to cater to the credit requirements of diverse sectors of the economy. Development of Agriculture : In an agrarian economy like ours, the RBI has to provide special attention for the credit need of agriculture and allied activities. It has successfully rendered service in this direction by increasing the flow of credit to this sector. It has earlier the Agriculture Refinance and Development Corporation (ARDC) to look after the credit, National Bank for Agriculture and Rural Development (NABARD) and Regional Rural Banks (RRBs). Provision of Industrial Finance : Rapid industrial growth is the key to faster economic development. In this regard, the adequate and timely availability of credit to small, medium and large industry is very significant. In this regard the RBI has always been instrumental in setting up special financial institutions such as ICICI Ltd. IDBI, SIDBI and EXIM BANK etc. Provisions of Training : The RBI has always tried to provide essential training to the staff of the banking industry. The RBI has set up the bankers' training colleges at several places. National Institute of Bank Management i.e NIBM, Bankers Staff College i.e BSC and College of Agriculture Banking i.e CAB are few to mention. 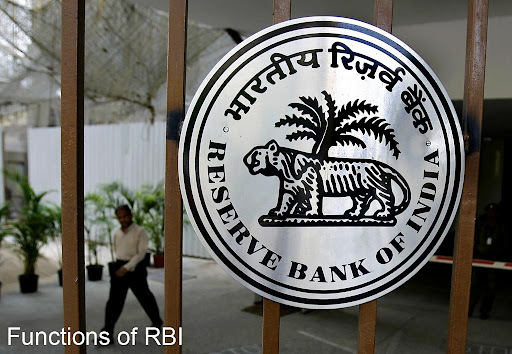 Collection of Data : Being the apex monetary authority of the country, the RBI collects process and disseminates statistical data on several topics. It includes interest rate, inflation, savings and investments etc. This data proves to be quite useful for researchers and policy makers. Publication of the Reports : The Reserve Bank has its separate publication division. This division collects and publishes data on several sectors of the economy. The reports and bulletins are regularly published by the RBI. It includes RBI weekly reports, RBI Annual Report, Report on Trend and Progress of Commercial Banks India., etc. This information is made available to the public also at cheaper rates. Promotion of Banking Habits : As an apex organization, the RBI always tries to promote the banking habits in the country. It institutionalizes savings and takes measures for an expansion of the banking network. It has set up many institutions such as the Deposit Insurance Corporation-1962, UTI-1964, IDBI-1964, NABARD-1982, NHB-1988, etc. These organizations develop and promote banking habits among the people. During economic reforms it has taken many initiatives for encouraging and promoting banking in India. Promotion of Export through Refinance : The RBI always tries to encourage the facilities for providing finance for foreign trade especially exports from India. The Export-Import Bank of India (EXIM Bank India) and the Export Credit Guarantee Corporation of India (ECGC) are supported by refinancing their lending for export purpose. The reserve bank also performs many supervisory functions. It has authority to regulate and administer the entire banking and financial system. Some of its supervisory functions are given below. Granting license to banks : The RBI grants license to banks for carrying its business. License is also given for opening extension counters, new branches, even to close down existing branches. Bank Inspection : The RBI grants license to banks working as per the directives and in a prudent manner without undue risk. In addition to this it can ask for periodical information from banks on various components of assets and liabilities. Control over NBFIs : The Non-Bank Financial Institutions are not influenced by the working of a monitory policy. However RBI has a right to issue directives to the NBFIs from time to time regarding their functioning. Through periodic inspection, it can control the NBFIs. Implementation of the Deposit Insurance Scheme : The RBI has set up the Deposit Insurance Guarantee Corporation in order to protect the deposits of small depositors. All bank deposits below Rs. One lakh are insured with this corporation. The RBI work to implement the Deposit Insurance Scheme in case of a bank failure. The Reserve Bank of India has a credit policy which aims at pursuing higher growth with price stability. Higher economic growth means to produce more quantity of goods and services in different sectors of an economy; Price stability however does not mean no change in the general price level but to control the inflation. The credit policy aims at increasing finance for the agriculture and industrial activities. When credit policy is implemented, the role of other commercial banks is very important. Commercial banks flow of credit to different sectors of the economy depends on the actual cost of credit and arability of funds in the economy. To read latest functions of RBI, please download official free e-book published by RBI. This free e-book is a pdf document compressed in a Rar file (8.92 MB). To extract and read this PDF document, you'll need 'Winrar' and 'Adobe Acrobat Reader' softwares (both are free) installed on your computer. Download Link - Reserve Bank of India - RBI Functions and Working. Visit the official website of Reserve Bank of India for additional information. Official website of RBI is :- www.rbi.org.in. this website has proven to be very helpful. the system and structure for searching information was perfect. I found everything I was searching for. I would like to thank you guys very much. awesome job. your gud job is appreciated admin & editors.. Keep on the gud work.. Thnx a lot for such a gud source of information. MOST USEFULL WEBSITE.PLEASE UPLOAD MORE BANKING TOPICS. Before printing of currency notes appropriate reserves has to be kept aside. Generally, this reserve is in the form of gold, foreign-currency reserves, etc. Finally, it's the decision of RBI (Central Bank of India) which has a direct control over supply and printing of currency notes in India.